Each craftsman's signature is subtly placed on the interior behind the iPhone after being hand-finished. If there is one central tenant to our family’s ethos, it is that a profound awe and respect for nature. That’s why everything we create here are Pad & Quill must be tied to it. For our Woodline, what we loved about it at first sight was the wildly apparent beauty of the wood grain. And then to add to that, is doesn't just look gorgeous, it also offers superb strength. Wood is strong on its own, but the ultra-strong Aramid polymer core combines with the inherent strength of the wood to offer 5 times the strength as steel ounce for ounce. 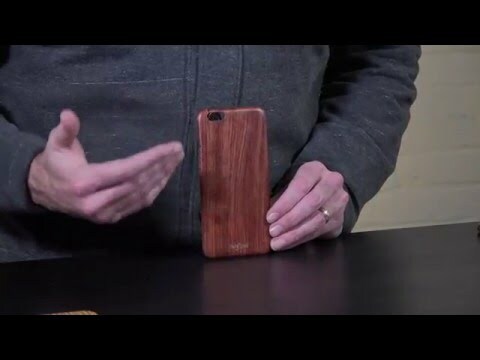 It does all of this while adding only less than a millimeter of thickness to your iPhone. Choose from 2 stunning hand finished hardwoods: American Cherry and Zebra Wood. Both offer an elegance only nature can provide while also cradling your iPhone in a blanket of protection. Each case is unique as the wood it was cut from. The lines of the wood grain that stood alone in nature are now entirely yours.